Looking for a fast and easy side dish to make for Thanksgiving this year? Something other than or besides the usual green bean casserole or marshmallow topped sweet potato casserole? Now, don’t get me wrong, my family loves green bean casserole and sweet potato casserole but each year I like to shake things up a bit and make something new. Easy Cheesy Cauliflower is that dish. Not only is this dish delicious, it’s portable too. 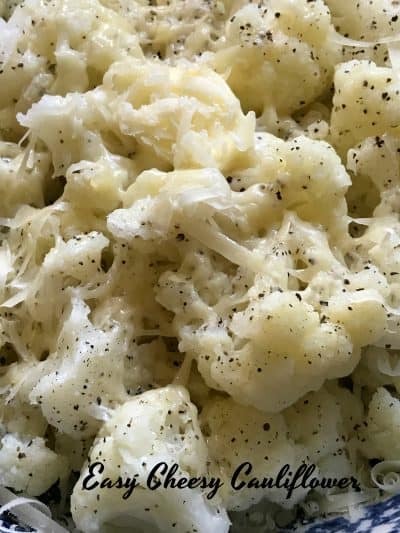 Easy Cheesy Cauliflower is an easy recipe to tote along to any function. There are a few things to remember when bringing as a dish-to-pass. Under cook the cauliflower slightly, this will ensure that it doesn’t become mushy. Tote the cheese topped cauliflower in a glass, covered casserole dish that has been lightly sprayed with non-stick cooking spray. Reheat in the microwave, covered for a few minutes. To make this dish extra special, sprinkle a handful of crispy bacon over the top before serving…or…do you have any canned crispy, fried onions leftover from your green bean casserole? Sprinkle those on top of the cauliflower too before serving. You might just have yourself a new family favorite! Easy Cheesy Cauliflower tastes even better when fresh cauliflower is in season. Super delicious and oh so easy. 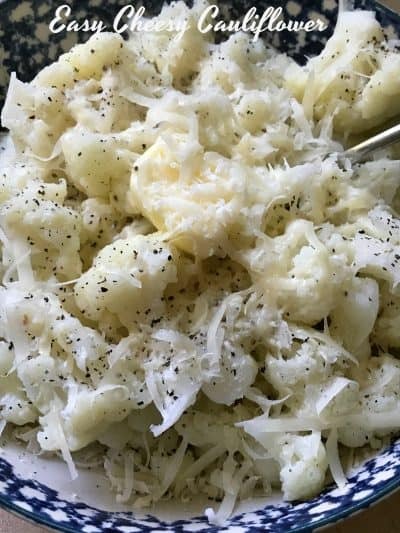 A delicious and cheesy side dish. 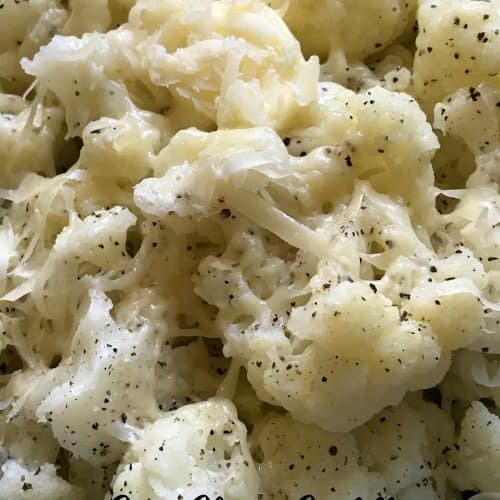 Boil head of cauliflower in lightly salted boiling water to cover until fork tender. Remove from boiling water and transfer to a serving bowl. 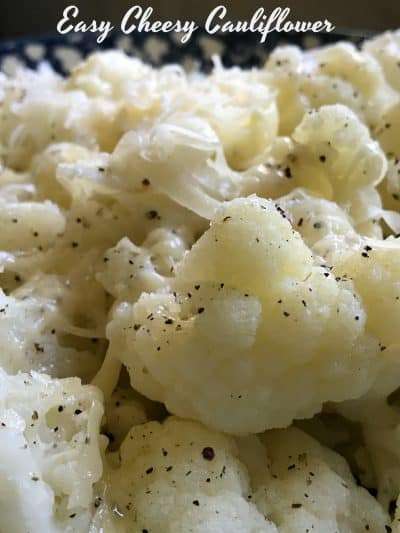 Sprinkle cauliflower with shredded Swiss cheese, Parmesan cheese and salt and pepper to taste. Top with a dollop of sour cream and chives if using. Serve.